Family of Bablu Roy and Shondhya Rani in front of their dilapidated house in 2007. Bablu was a van driver and an able bread earner of this family when he joined the demonstration to seize the office of Asia Energy on August 26, 2006. He became wheelchair bound because of the injuries by bullets shot by the border force of Bangladesh to his lower part of spinal cord. Bablu was just an ordinary demonstrator amongst other 70,000 people on whom the state armed forces open fired indiscriminately on that day. 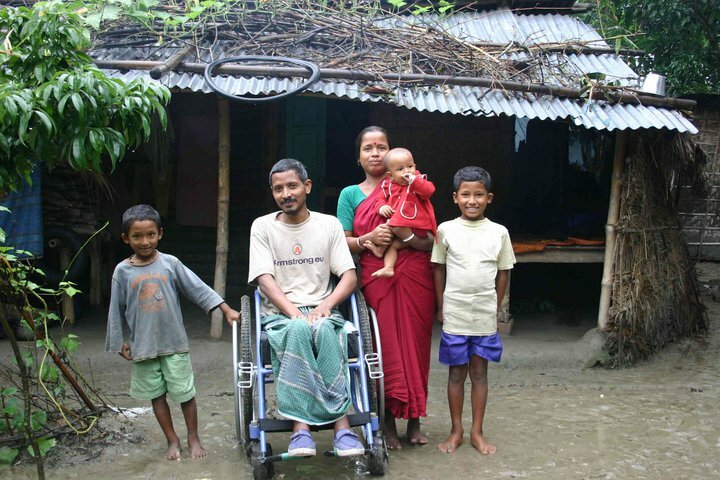 This photo was taken after the family was reunited when Bablu Roy returned home spending one year in hospital. To learn more about the protesters of to be established open-pit coal mine in North Bengal (Dinajpur) watch the documentary film – হাঁরা কয়লা খুনি চাই না (we don’t want the coal mine).